Vs. S.H.I.E.L.D. you say, vs, S.H.I.E.L.D. you say! Why yes sign me up for Brian Michael Bendis’ Uncanny X-Men: Vs. S.H.I.E.L.D.! Cyclops has had enough! His outlaw team of X-Men keep getting attacked by sentinels, and believing S.H.I.E.L.D. is the source he goes straight to Maria Hill for answers. The confrontation leads to an all-out attack on the front lawn of the Jean Grey School for Higher Learning where the mastermind behind a plot against S.H.I.E.L.D., the Uncanny X-Men and the X-Men is finally revealed. Afterwards, the last will and testament of Professor Charles Xavier is read to his former students. It reveals a horrible secret a powerful new mutant, and maybe another shocking secret that some cannot get out of their head! We learn all about what Director Hill likes in a man with this story. Hill likes men that she is morally despises! This comes out when the Uncanny X-men telepathically scan her and the fact she has a secret crush on one of them pops out of her brain. So the Secret Avengers romantic tensions with M.O.D.O.K. now make perfect sense. And that time she had a romantic relationship with Tony Stark is completely understandable now. The future is now clear, a romantic get-away with the Red Skull in 2015! One of the nice things about this story is we get a resolution for Agent Blaire’s storyline. And sadly for this S.H.I.E.L.D. agent it has not been a happy road. The story also gives her room for future stories and reoccurrences in comics! So Agent Ben can be happy that Dazzler is out there. There is a lot in this tale that will feel familiar. Part of the attack on the Jean Grey School will fell like it was ripped right out of Captain America: Winter Soldier. But then when we are talking about S.H.I.E.L.D. stuff like this happens all the time! And fans of the X-Men movie franchise will also feel like they are standing on familiar territory. This familiarity will include how Professor X handled some of the matters in his will, who Xavier loved and how Cyclops arranged a private conversation with Hill. It is familiar enough material one might wonder if Bendis held his own movie marathon pre-scripting. Of course, he does give all of these elements his own spin. But again déjà vu is an acceptable feeling! There is one panel of art that perplexes me. In the midst of art provided new for this story is a panel that appears to be from the 1970s or 1980s. Now, contextually it makes sense because both are a conversation between Blob and Magneto. But I keep asking if the panel was just a placeholder that was never removed! Or is it meant to be art? 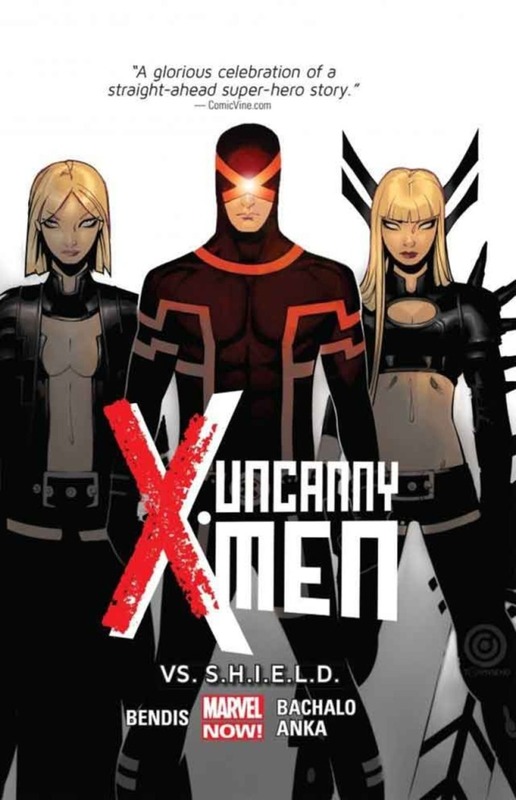 Uncanny X-Men: Vs S.H.I.E.L.D. brings us explosions and a reveal that has been building for several story arcs. Now with Professor X’s will read the X-Men have a new challenge. And one has to wonder will the two sides of the X family be able to work together?